DEATH VALLEY National Park, located in the southwest corner of California, bordering Nevada, is a land of extremes: a below-sea-level basin, steady drought and record summer heat. Yet it harbors both delicate (rare wildflowers and tiny fish) and harsh beauty (striking landforms and geology). People come for the extreme climate (believe it or not) and landscapes. The valley itself is a rift basin or graben (an area dropped down between two or more faults). In fact it is one of many within the Basin and Range geomorphic province which covers much of the western USA and northern Mexico. Photo: Badwater Basin salt flat (middle right); the colorful rocks on the left are volcanic. The valley (basin) sits 282 feet (86 m) below sea level, while Mount Whitney, only 85 miles (137 km) to the west, rises to 14,505 feet (4,421 m) in the Sierra Nevadas. 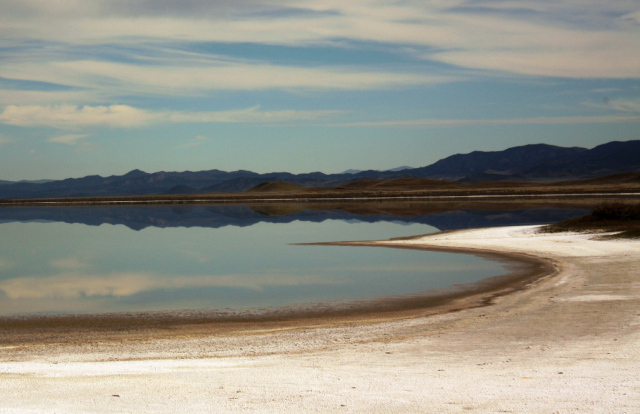 A lake filled the valley in wetter times and left behind salt and borax minerals. Geology in the park is amazing, stretching in age from 1.7 billion years old Precambrian metamorphosed rocks to Cenozoic and Pleistocene sedimentary rocks, volcanics and modern sand dunes. My husband, an expert in depositional environments, recognized sedimentary rocks belonging to shallow seas, lakes and braided streams and alluvial fans.The sedimentary layers shown in the photo below were probably deposited by a braided stream and later uplifted and tilted . Periods of extensive volcanism and tectonic deformation shaped the landscape. (click on arrows to see the 3 slides) Desert candle, Caulanthus inflatus (even better!) above, grows 3-4 ft tall. I kept seeing these gorgeous orange “bushes” but looking closely I realized the bizarre orange matter (it looks something like soft fishing line) was twining itself around other plants. (Click on the small pictures above to enlarge.) Although colorful, this plant is parasitic and unfortunately destructive. Then there are the mysterious “Sailing Stones” found on a dried-up, flat lake-bed, each one followed by a track incised in the earth. Some of these furrows are straight, others are curved, but how did they form? They appear to have been dragged, but no one has ever seen the rocks move. Magic rock (one of dozens). Thanks to Jon Sullivan for sharing this photo. A temperature of 134 degrees F (56.7 C), a century ago is thought to be the highest ever recorded anywhere. Summer is regularly over 110F (>43C); 116 F (>47C) was the average high last July and August. Flora and fauna live on the edge and biologists worry about desert species surviving a change to an even hotter climate. 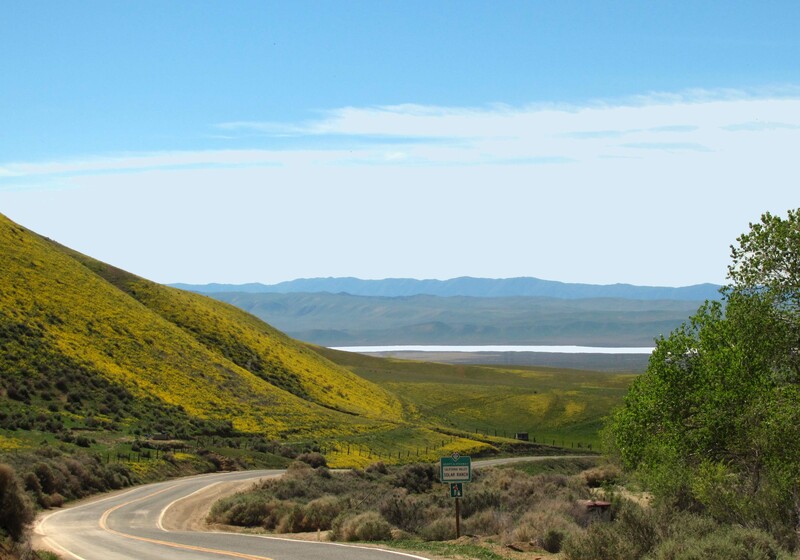 The Death Valley region is the northernmost part of the Mojave Desert, in California. A rain shadow effect makes it North America’s driest spot, receiving about 1.5 inches (38 mm) of rainfall annually in the lowlands like at Badwater; however that more than doubled for this rainfall season. Several springs derive water from a regional aquifer. Much of the water has been there since the cooler and wetter climate of the Pleistocene ice ages. Today’s drier climate does not provide enough precipitation to recharge the aquifer. In 1977, Death Valley was one of the filming locations used by director George Lucas for Star Wars. When I first visited Death Valley (way back) in my college days, you would occasionally see old wagons like these or even Model T’s stuck in the sand. I remember Dr. Webb, my geology professor, pulled out tools and scavenged a rusting car for parts for his own Model T! Comments? Questions? Ask me anything about this post. Late in the season there was a most unusual storm that brought twice the normal annual rainfall to the northern desert in a matter of days. The silver lining in this dark cloud is that it bode well for wildflower season. (The bad news was a flash flood destroyed or damaged roads and buildings in the park.) 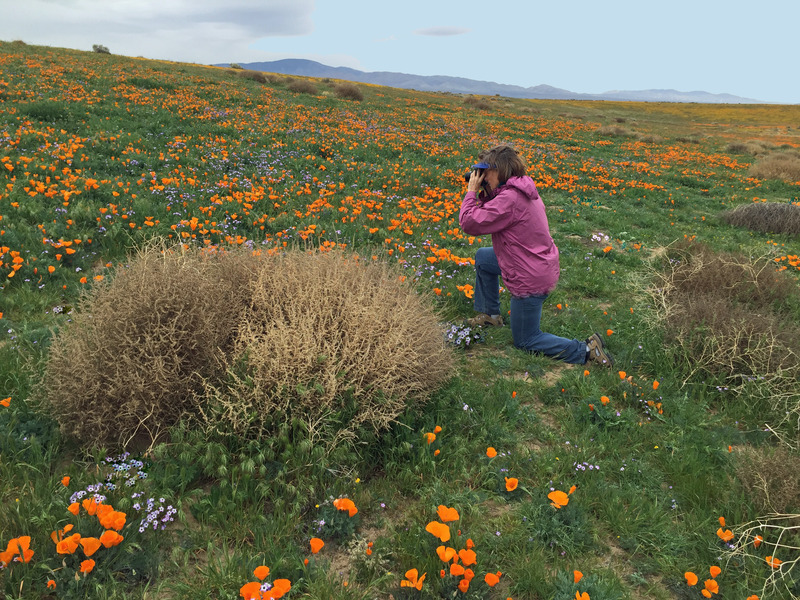 Rain occurred again in early 2016, but I only heard that there was a “super bloom” after it was well underway. Being that this this is known to happen in Death Valley only once or twice in a lifetime, we started looking for tickets to the nearest airport (Las Vegas, Nevada- a two hour drive to DV), lodging (not easy), car rental etc. Having accomplished that, we arrived a couple of days later, just in time to catch the last phase of the flowers. It was worth it. Thursday we drove to the north only to find Scotty’s Castle Road closed by the flood. Not to be deterred we walked up the now dry wash into the canyon and were amply rewarded with a wealth of species. My husband discovered our first “Five-spot” and then we saw many more after that. I spotted this red plant (above) up the wash, assumed it was a flower and walked over to discover it was an infant 5- spot; the red leaves discourage predators from eating tender shoots. 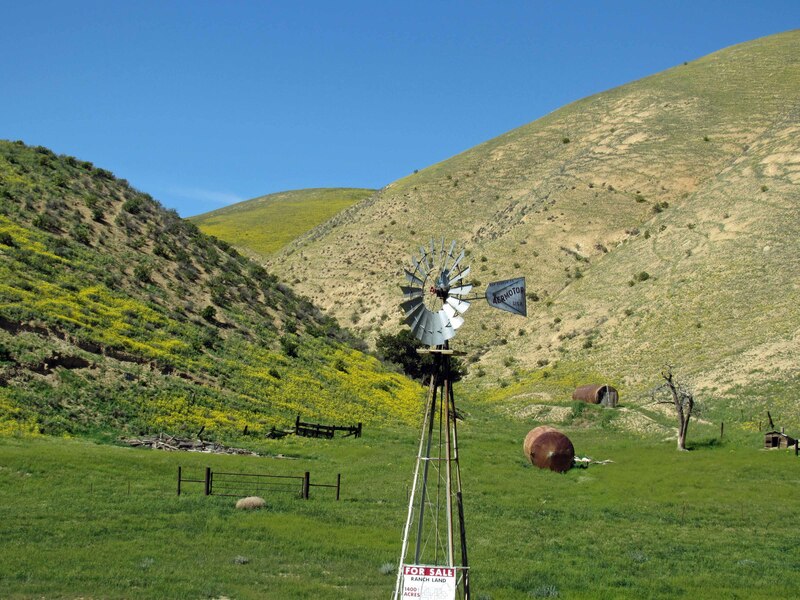 While I would never visit the desert in summer – or even winter – it is a whole different landscape in spring if the area has received some rain. Have you been there? Solar Energy – a double-edged Sword? Many acres of land in the California deserts and environs are covered in solar panels and wind farms. Green energy – win- win right? Not so fast; there are a few factors to take into consideration. Do I dare play devils’ advocate here? Environmentalists are finding themselves in the awkward position of having to choose between clean energy and conserving fragile arid ecology . In spring – however in a few short weeks the color will disappear. Just as wetlands and marshes were considered useless swamps to be filled and “reclaimed” decades ago, deserts are often viewed as worthless land. In fact many desert areas are surprisingly pristine, supporting a unique and delicately balanced ecosystem, and paving them for development or solar panels is a mistake, especially when already-disturbed sites exist as alternatives. I can’t understand why rooftops and existing infrastructure are not being considered as the first option; an advantage to siting near electricity users is the reduced need for new transmission lines and the decrease in energy lost in transport, both of which reduce costs. I’m looking into solar panels on our roof now that it is economically viable. Utilities however aren’t keen on buying electricity from their customers – they want the energy and the cash to flow in the other direction. Solar panels put to good use. Not so good when they cover acres of land. 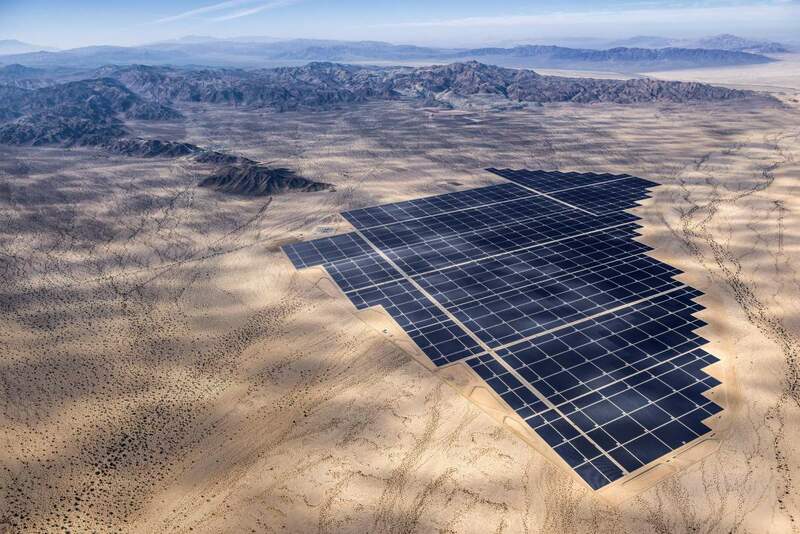 Carrizo Plains, just northwest of the Mojave Desert is one of the sunniest places in California and thus exploited by the solar power industry. While not really a desert in itself, it is an arid environment with an average elevation of about 2,200 ft (700 m). No trees grow there and the annual rainfall is less than 9 inches (230 mm) per year. It did support ranches back when ranchers regularly moved herds between these winter grazing areas to the higher, cooler slopes for summer. If you look closely, beyond the old ranch shack (below) you can see a dark line in the distance which is part of a solar farm. Those are tumbleweeds in the foreground. Soda Lake a 3,000-acre (12 km2) ephemeral lake lies in the middle of the plain; the creek draining into Soda Lake is dry most of the year. The lake itself is often gone by mid-summer, but this year due to the drought, it was already dry when I visited in early April . Normally it attracts migratory birds, but they had to fly farther to find water the last two winters. A dazzling white crust is what remains from the evaporation of mineralized water. Soda Lake(dry) and the Carrizo Plains in the background. 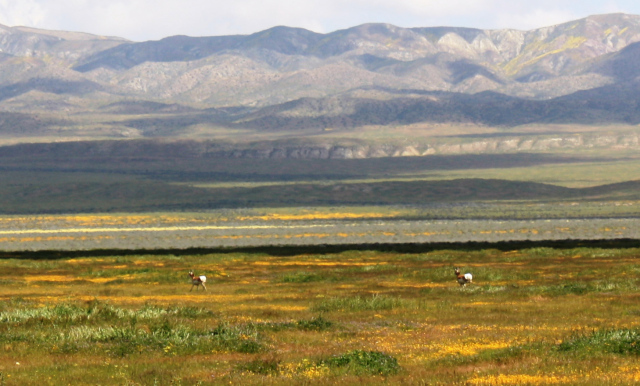 The Carrizo Plains is home to astonishingly diverse communities of wildlife and plant species. 13 different species are listed as endangered, the largest concentration of endangered species in California. The desert tortoise is one; other species include the pronghorn antelope, Tule elk, burrowing owls, coyote, desert cottontail and the San Joaquin kit fox. 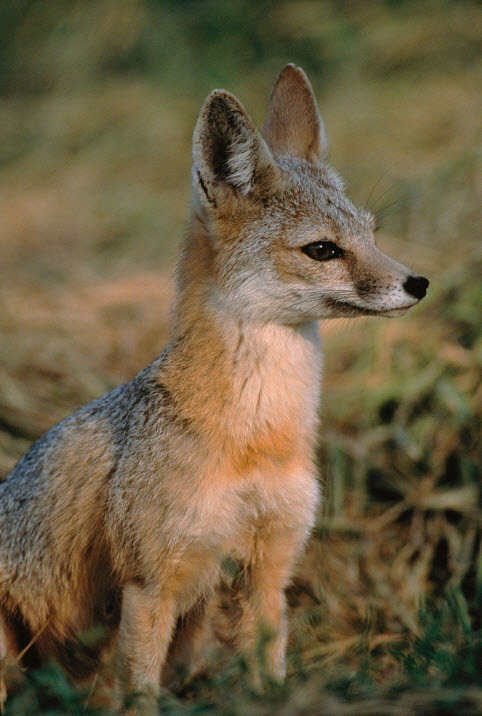 Kit Fox – cute isn’t he? Disclosure! All of the photos in the slide show below were taken in spring when the desert and surrounding areas are looking their best.. Most of the flowers last only a month… or two if there is spring rain. Southern California (really most of California ) gets the bulk of rain in the winter; showers the rest of the year are rare and fleeting. The Carrizo Plains became home to the largest photovoltaic array in the world in the 1980’s when Arco bought 177-acres (0.7 km2) of ranchland. Another solar farm was constructed by Ausra on an adjacent 640 acres. Neither were able to compete with fossil fuels, but as solar recently became economically viable, a third party Topaz Solar, bought Ausra and minimized the use of land. Topaz began operation in November. 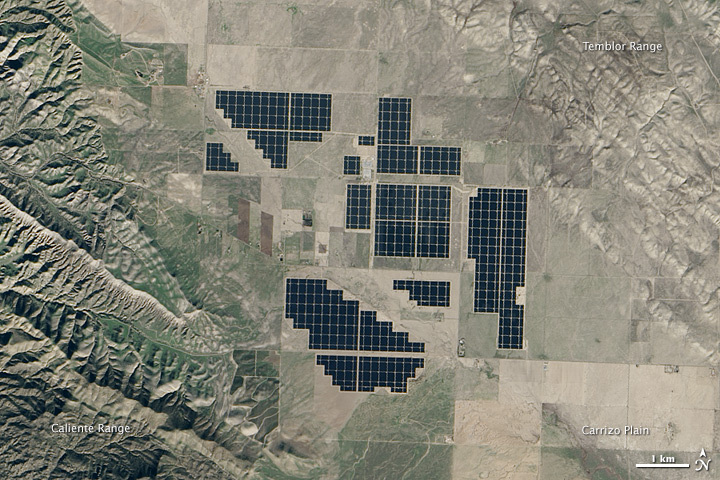 above:Topaz Solar Farm from space Earth Observatory image, 2015 (on Wikipedia). Below, an aerial shot of another solar farm, this one in the southern Mojave Desert. photo by J. Stillings for Time mag. The sheer size of these projects results in habitat loss and fragmentation making it more difficult for wildlife to find food, water, shelter, mates, and protection from predators. During and after construction the area becomes a dust bowl due to removal of vegetation. Solar projects have also been criticized for killing large numbers of migratory birds coming south for the winter. Some crash into the reflective panels they assume is a body of water. Others birds are burned to death in midair, along with insects and hundreds of butterflies, by the scorching CSPs (Concentrated Solar Power). Wildlife and plant life everywhere are already affected by climate change so the destruction of vegetation and habitat is a major impact, important for us to minimize and mitigate. One way would be to develop renewable energy projects on already disturbed or degraded lands like brownfields, abandoned mines, or landfills. We need to encourage the development of green energy, but not view it as a panacea. (I haven’t researched wind power, but it also takes up huge amounts of land and kills an astounding number of birds.) There is no free lunch. Everything is a trade-off and must be considered carefully to weigh the best options. What do you think? Where do you stand? Have an opinion? Weigh in! 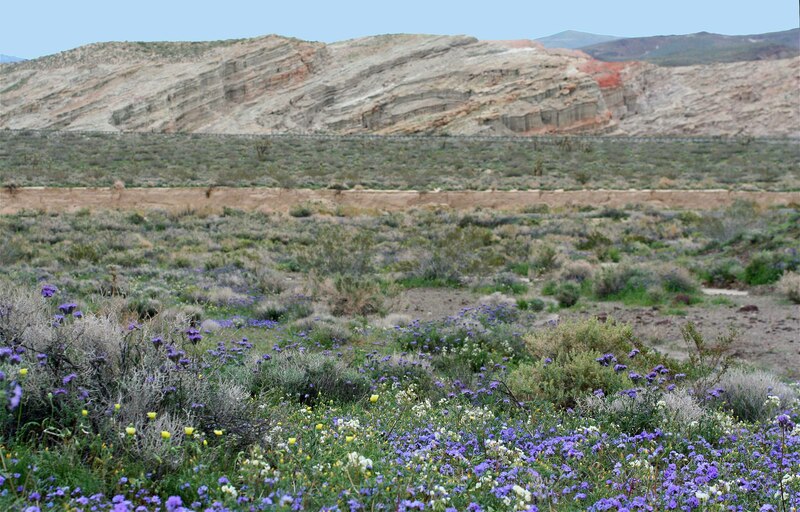 The California Deserts (Mojave and Colorado) are unique and fascinating places, with many plant species and wildlife that are found nowhere else on earth. When I first went looking for wildflowers in the desert over 20 yrs ago, one had to carefully to plan where to refuel and stock up on water and food. Lodging was dodgy so we camped. None of these is a factor anymore. Highways quickly get you where you want to go and pit stops like Mojave have become towns. The scary thing is that little desert towns have become cities. (Palmdale has an IMAX now!) All this means development – and loss of wild lands (and loss of wildflowers). Solar panels cover acres ( a double edged sword I’ll discuss another time). Large numbers of these caterpillars were busy eating wildflowers – I hope they become beautiful butterflies! Near Red Rock Park. The line below the rocks in the back ground is a highway, the linear feature below that is the California Aquaduct heading towards L.A – and in the foreground are purple phacelia and white camissonias. There is a certain to beauty to desert landscapes and, as you can see, it is not a barren wasteland, but has its own ecosystem. The slides below were taken in the Mojave, just east or southeast of where the Sierra Nevada Mountains die out, near Red Rock. I have emphasized wildflowers ( and some wildlife) because it is spring, but the rocks and sand dunes are interesting in themselves. Have you ever visited a desert?